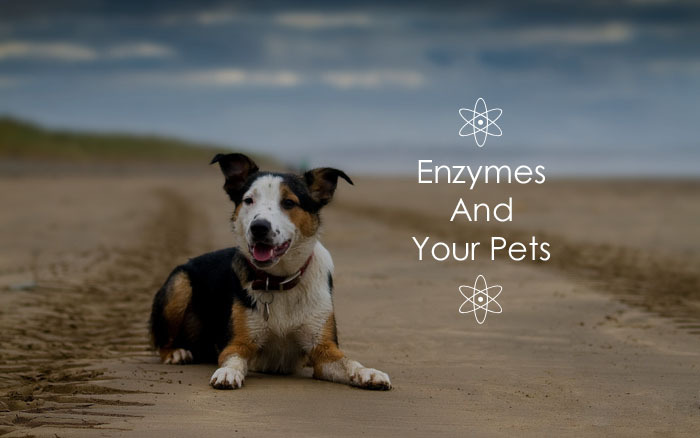 Enzymes are proteins used by your pet’s body in many different physiological functions such as healthy cellular activity, detoxification and the breaking down of nutrients in their food. Let’s look at these vital proteins and gain some understanding of their importance for dogs and cats. Metabolic enzymes are deeply and critically involved in running a body’s functions and maintaining cells, blood, tissue and organs. Internally produced, they are necessary for all new cell growth and maintenance. Simply put, metabolic enzymes are the builders and maintainers of all cells. Digestive enzymes function in the gastro-intestinal system to break down your pet’s food. They are produced internally by the pancreas and are also provided in an animal’s diet. As you can see by their function, enzymes are of utmost importance to biological life. They build and maintain the cells that operate every element of living. In fact, without enzymes, life would not be possible for your pets. While the body produces enzymes, it cannot produce enough by itself. It relies on enzymes found in food for replenishment. A lack of enzymes in the diet will result in incomplete digestion and a tasking of the body’s enzyme factory beyond its capacity. As the pancreas attempts to compensate to support digestion, vital operations, notably immune function, are compromised. This leads to many forms of disease, illness and premature aging. Most commercial pet food does not provide the balance of nutrition that your dog or cat requires. Enzymes are easily destroyed by heat and the modern processes of food manufacturing, including the use of pesticides, herbicides, colours and preservatives. “For a food to maintain its natural enzymes, it must be uncooked and unpasteurized, non-irradiated, and untreated with any source of heat. To be frank, today’s commercial pet foods lack healthy natural enzymes. In essence, the food is dead, over-processed and in-organic. Production of both canned food and dried kibble require very high temperatures, which destroy any live enzymes present in the food. If the manufacturer adds enzymes, they often break down when exposed to air, light, and the processing needed for the food’s long shelf life. A species appropriate diet of raw meat, fresh vegetables and fruit goes a long way towards supplying needed enzymes. Yet, the ancestral canine and feline diets contained parts of the prey animal…namely internal organs, that are not readily available to domestic pets. Tissue from the pancreas, intestines and stomach were wonderful sources of enzymes for these ancient “wild” animals. Quite literally, you will be keeping your dog or cat alive! BiologicVET provides the proper balance of enzymes your pets need to sustain healthy digestion, immune and cellular function, tissue, muscle and bone maintenance, skin, coat and general health.